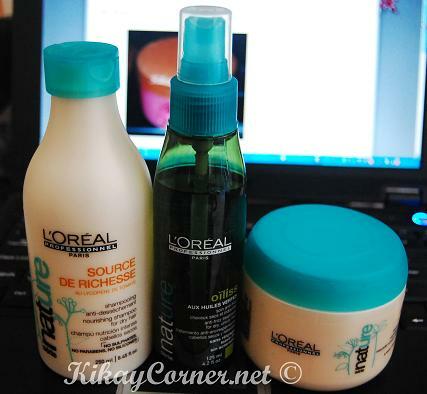 The L’Oreal Professionel Serie Nature set was given to me for Christmas by my good friend Frances of BeautyForALiving.com. My hair’s favorite is the Anti-Frizz Treatment Oil for Dry, Unruly Hair! I am a great fan of beauty products that are derived from nature. But here’s one thing I have noticed, most plant derived “branded” shampoos make my hair fall. The same is true with Phtocyane Revitalizing Shampoo by PHYTO Paris. And as much as I love Serie Nature shampoo’s texture and smell on my hair, it seems to make my hair fall as well. But the hair masque and the anti frizz treatment stuff are love! I even checked out with my local hairdresser and they have it there! I will happily buy and get the receipt straight from those epson tm-t88iv thingies, when my supply runs out! They aren’t exactly cheap. A tub of masque costs around $30 and the anti-frizz around the same price. Pretty steep, eh. On second thought, I guess I’d still pick Kerastase any day. Nothing has done my hair better so far. I tried VMVs clarifying shampoo once. Loved the scent, it did my hair good for a week. But then my hair got too heavy thereon. While my face can take any product, but sadly my hair isn’t as tolerant.